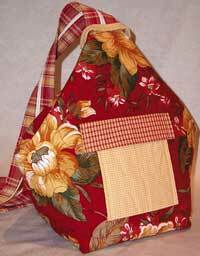 Chelsea Tote - Retail $10.00 [LGD116] : Wholesale Purse Patterns, Purse Patterns at wholesale prices for quilting shops, craft stores, and fabric shops. The Chelsea Tote bag pattern is a combination tote/sling bag or backpack that is loaded with lots of pockets and uses a "no fear" zipper technique. Finished size is 14" tall with an 8" square bottom. Bag-E-Bottom E is available for this pattern and gives a professional look to the bottom of your bag.